Connections and close relationships are vital to our health – physically, mentally and emotionally, as well as to our self esteem, energy and longevity of life. After 60, you may find that you have resistance to new connections and relationships and you may be asking yourself – where do I even meet new people? This was my thought at age 61, and I can assure you it is a common thought pattern among your peers. But rest assured, there is a myriad of options for you to explore. See below for the list that I began to explore just a short 3 years ago that I think will help you. Get the positive energy flowing by working with others for a good cause. Whether you decide to help out at your local animal shelter, feed the homeless every week, or something else entirely, there’s a volunteer option to fit everyone. AARP has a multitude of resources for seniors, ranging from careers to caregiving, as well as creating a community for like minded seniors. Right now they are celebrating Good Neighbor Day which is happening on Sept. 28. 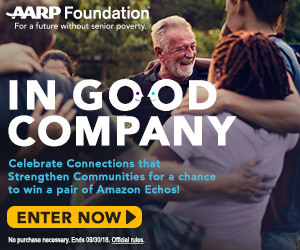 Sign up for their Connect2Affect and the AARP Daily Newsletter for even more ways to connect with your neighbors and community. Click the banner below to sign up! Do you miss challenging yourself and learning something new? Your local community college or university offers informal, continuing education classes for adults. So whether you want to take a hand at becoming a sommelier, learn a new language, or take a creative writing course, it’s never too late. Some classes are even free! Senior centers have expanded past your typical bingo night, into a variety of activities, day trips and retreats. Stop in, talk to someone, and begin creating a local community. Talk to your friends and family about any opportunities to get engaged with the younger generations. Connect with them and find out how they are shaping the world today and how your wisdom, knowledge and experience can assist in moving this world forward. Above all else, it’s important to know that there are other people your age who are also looking for new friends and connections. It’s not something that everyone wants to admit they want or need, so get out there, try something new and start the conversation! *Disclaimer: This article was written to promote AARP.